It’s the second-to-last week of oral arguments of the Term, and some of the last big cases are being argued. The courtroom is packed and filled with anticipation, not so much for the first case to be argued today but the second. The first case is Susan B. Anthony List v. Driehaus, in which the underlying issue is Ohio’s statute prohibiting false political speech, though before the Court is a drier question of who may challenge such a law and when. This is a pretty interesting case in and of itself, especially if one reads the amicus brief of the Cato Institute and the humorist P.J. O’Rourke. These well-dressed members of the telecommunications bar will be tapping their Gucci loafers a little longer than they expected before getting to that case. Such an anticipated case might normally be argued first in the day. But when a member of the Court has recused himself or herself, that case is often scheduled as the second argument, allowing the Justice in question to take the bench for the first case, then relatively inconspicuously slip out during the brief break between the first and second cases. That may explain why the Aereo case was scheduled second today, because Justice Samuel A. Alito Jr. was originally recused. 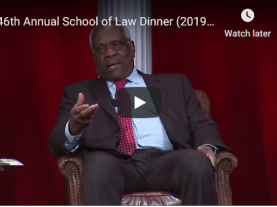 (The Justices typically don’t publicly explain why they are removing themselves.) Last week, however, the Court announced that Justice Alito would be participating in the Aereo case after all. Presumably he sold his stock in one or more of the corporate parties in the case, and thus no longer had a conflict, but there was no confirmation of that. Before either case is argued, we will get opinions this morning. In my capacity as someone who writes frequently about education law, I received (secondhand) an email from a prominent education organization on Monday suggesting that today was the day for the Court’s long-awaited decision in Schuette v. Coalition to Defend Affirmative Action, about Michigan’s ballot-enacted prohibition on considering race in college admissions. It’s not unusual for these types of emails to circulate in Washington, especially in June, when groups claim to know that a particular decision is coming down on a given day. Since the Court does not announce what’s coming in advance, most reporters pay little heed to such messages, which usually turn out to be wrong. Still, since it is only April, I think to myself that the education group’s prediction is unusually specific. Among the visitors to the Court today is Cecilia Marshall, the widow of the late Justice Thurgood Marshall, who is a frequent presence for big arguments and other events. 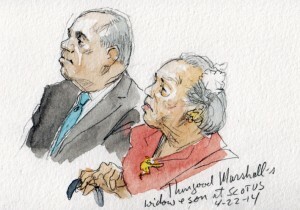 She is joined in the front row of the public gallery by her son Thurgood Marshall Jr., known as “Goodie,” who has served in government but is now a lawyer in private practice. Just minutes before the Justices take the bench, Christopher J. Dodd, the CEO of the Motion Picture Association of America and a former Democratic senator from Connecticut, takes a seat near the Marshalls. I’m assuming that while as a former politician he may well be interested in a state law that bars false political speech, he is probably here for Aereo. It will not be the last time today that Justice Breyer refrains from joining his liberal allies. Next, confirming the speculation of a certain education group, the Chief Justice says that Justice Anthony M. Kennedy will announce the Court’s judgment in Schuette. This is a big deal, and that prompts some consternation in the press rows, since it is already a busy day with two big arguments to come. We’re pretty sure he said this last part in court, though Justice Kennedy, unlike some of his colleagues, does not routinely provide the text of his bench announcements — the summary the justice reads from the bench — to reporters. The announcements, though they hew closely to the text of the actual decision, are often slightly more conversational or have other minor differences. “Here Michigan voters acted in concert and statewide to seek consensus and adopt a policy on a difficult subject against a historical background of race in America that has been a source of tragedy and persisting injustice,” Justice Kennedy continued. Justice Elena Kagan did not participate in the case. 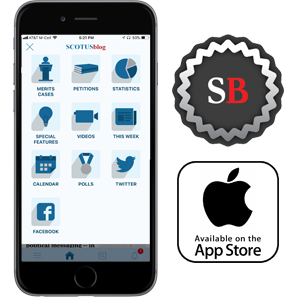 Justice Sonia Sotomayor has written a dissenting opinion, joined by Justice Ruth Bader Ginsburg. Justice Sotomayor continues, often reaching what seems like it might be her rhetorical closer, only to continue for several more minutes each time. But she saves her sharpest lines for the end. Justice Scalia, in his own written concurrence, has some sharp words for Sotomayor as well. He says it is “doubly shameful,” to equate, as he suggests the dissent has, the majority behind Michigan’s ballot initiative with the majority responsible for Jim Crow. Today, the rancor of the Court’s bitter spring of 2007, which included sharp opinions and dissents not only in Parents Involved but also Gonzales v. Carhart (on so-called partial-birth abortion) and Ledbetter v. Goodyear Tire and Rubber Co. (on women’s pay equity), has returned, at least for a day.